“Interco Holding” is the group of companies, which include an outgoing tour operator “Intercontinental”, incoming tour operator “InterGeorgia”, “Interavia” - an air ticketing and ground handling service provider and international educational program consulting company “Interstudy”. 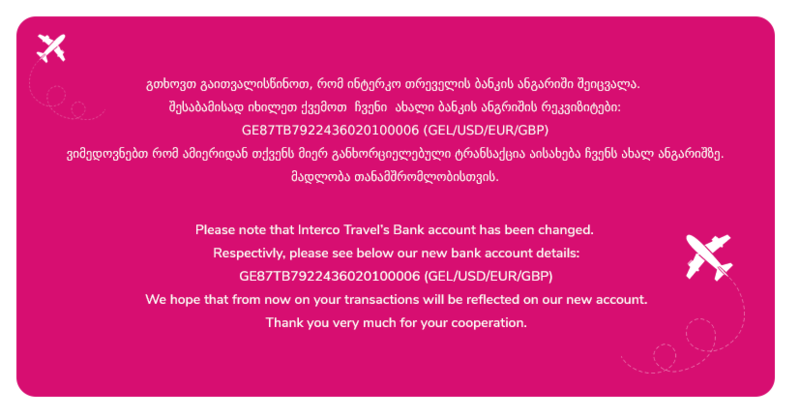 “Interco Holding” has started by establishing touring company “Intercontinental”, which developed and broadened not only own activities and service quality but Georgian touring market as well. Nowadays “intercontinental” is one of the leading touring companies in Georgia. It has already been working in tourism successfully for 24 years. Being oriented on quality and high class of service enabled it to become a leading tourism company. Consequently, as the best touring company in Georgia, it has been awarded with “Golden Brand” since 2007. Thanks to its offices in Tbilisi and branches in Erevan, Cairo and Almaty, a wide network of agencies, qualified team and long-standing experience on the market, “Intercontinental” successfully offers various kinds of services and products to its clients and partners in: Europe, Asia, Middle East, Latin America, etc. This company has established business communication with leading touring companies in Italy, Spain, France, Great Britain, Austria, the Netherlands, Greece, the Czech Republic, Malta, Bulgaria, the Baltic countries, Ukraine, Russia, Poland, Thailand, India, Tunisia, United Arab Emirates, etc. In 2006 Tour Operator “Intercontinental” started direct charter flights to Antalya. Later the company developed a new project and has been operating charter flights to Egypt, in particular to Red Sea resorts: Sharm el-Sheikh, Hurghada, and Taba. In 2013 “Intercontinental” fulfilled direct charter flights to Kingdom of Jordan, capital Amman and offered customers to relax not only on the Red Sea but the Dead Sea resorts as well. Inbound Tour Operator “InterGeorgia” was established on the base of “Intercontinental” to operate and develop company’s incoming and inner tourism direction in Georgia. “InterGeorgia” offers its foreign and local customers wide choice of touring services, including: short and long excursion programs; cultural, medical-treatment, culinary, adventurous tours and special interests tours; summer, winter and multi season touring products in Georgia. Also it offers organizing conventions, meetings, conferences, and banquets. “InterGeorgia” offers its customer’s hotels bookings, railway,other land transports, concerts and other tickets reservations. The experienced transport partners of the company plan and provide transporting customers to desired destinations. In 2013 “InterGeorgia” carried out a massive touring project of charter flights Cairo-Tbilisi, which brought a company to higher level and it became internationally acknowledged. The future plans of “InterGeorgia” cover various touring projects and introduction of some services, including individual and group tours from close and remote countries; charter flights in Tbilisi and Batumi, the Black Sea resort in the summer. The member of “Interco Holding”, Air servicing Company “Interavia” was established at the end of 2013 with its own sales point in Tbilisi Airport. This business covers booking, selling air tickets and consulting. Moreover, an experienced and qualified team of “Interavia” will serve its customers 24 hours a day with the best prices and experience on the market. The Ground Handling Service department of “Interavia”will offer soon services, such as: supervising and representation of airlines, excess baggage collection, mishandled baggage delivery, crew transportation, SLOT and schedule permissions, charter agreements, coordination of operational activities between the airline and airport handling company, as well as leasing with the civil aviation authority and airport authority. The newest member of“Interco Holding” team is “Interstudy”, which is oriented on searching educational programs abroad, introducing exchange programs and creating studying packages. Nowadays team of “Interco Holding” has 50 qualified staff members, whose professional development is included in priorities of the company. The team’s devotion, high standard of the product and individual approach to every single customer and colleagues makes “Interco Holding” the Partner You Can Rely On. Indeed, not mine, not anybody’s. Seeing and enjoying colors is about passionate approach to adventure and discovery and a bit of risk. It gives me a great pleasure to be in business officially allowing me to color other’s lives by showing them world through travelling. It has been 24 interesting years as a founder of Intercontinental LLC I am involved not only in travel arrangements but in creating lifetime experience for numbers and numbers of people. With love, dedication and passion Intercontinental LLC has grown into Interco Group- a group of travel related companies, success of which we owe to love of traveling, our reliable partners and of course our valuable clients, happiness and honesty of whom has always been a great driver and inspiration for the company growth. At given moment Interco Group with its companies is glad to serve you in multiple directions, such as: outbound and inbound tourism, ticketing, MICE, chartering, leisure and business travel planning. Through our local and international offices we are happy to extend standard and tailor-made programs to you and your clients anytime and anywhere. I am happy to introduce you our new web site and invite you to discover its almost unlimited possibilities and tools that allow you to enjoy pleasure of planning travel, buying and selling travel online. On behalf of Interco Group I would like to thank you for being with us and wish you an enjoyable navigation through our web site and a memorable journey through all colors of the universe.